How to turn direction of 4 planar wheels into up/down motion? For the head in a 2D plotter I have 4 gears in an X configuration in the same plane. The gears are driven by belts from the outside in different combinations. The top and bottom gear can be turned in opposite direction as indicated by green arrows. 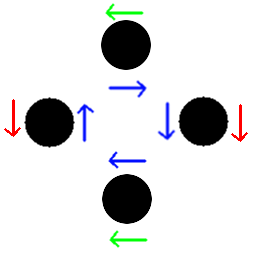 Or the left and right wheels can be turned in opposite directions as indicated by the red arrows. Both of those can happen simultaneously. The gears can also be driven all in the same direction as indicated by the blue arrows. Or all directions can be reversed. This is part of a larger construct and the belt movement already has effects there so they can't be changed. 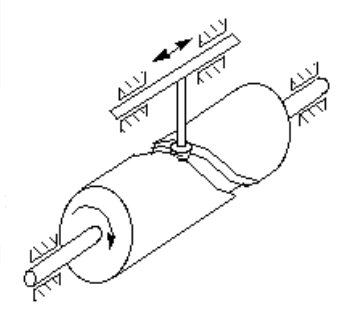 Now what I want to build is some mechanical contraption that turns the blue arrow movement into an upward (or downward if reversed) movement to rise (or lower) the pen of the plotter. If all wheels turn anti clockwise the pen should rise. If all wheels turn clockwise the pen should lower (or vice versa). The outside surface of the cylinder can mesh with the four gears in the image and it will be placed among them. the cylinder is open from top and bottom. this part will be placed inside the cylinder. this part will have pins that are meshing the inside grooves of the cylinder. this part cannot rotate. it can only move up or down. When the gears rotate according to the blue arrows >>> the cylinder will rotate (meaning that the groves will rotate) >>> and since the pen holder cannot rotate, the groves will force it to move up or down. The below figure shown the same idea but with a cylinder that has an outside groove. Not the answer you're looking for? Browse other questions tagged mechanism or ask your own question.